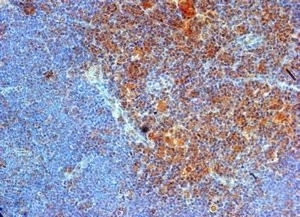 Staining of paraffin embedded mouse thymus with Goat anti mouse CD289 (AAM74). 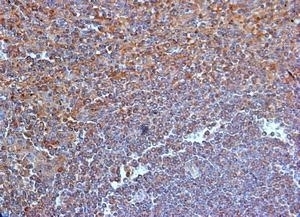 Staining of paraffin embedded human spleen with Goat anti mouse CD289 (AAM74). Goat anti Mouse CD289 antibody recognises murine Toll-like receptor 9, also known as CD289 or TLR9. CD289 is an 1032 amino acid ~120 kDa endosomal single pass type I transmembrane glycoprotein with a number of leucine rich repeats and a single TIR domain (UniProt: Q9NR96). Goat anti Mouse CD289 antibody recognizes an epitope within the N-terminal (NT) region of CD289, a member of the toll-like receptor family, which triggers MyD88 and TRAF6, resulting in NF-kappaB activation, cytokine secretion and the inflammatory response. CD289 acts as a receptor for unmethylated cytidine-phosphate-guanosine dinucleotides in bacterial DNA (CpG-DNA), playing a primary role in pathogen recognition and activation of innate immunity and has been shown to play a role in defence against systemic mouse cytomegalovirus infection. Goat anti Mouse CD289 antibody is reported as suitable for use in immunocytochemistry on acetone fixed cells. Antiserum to mouse CD289 (NT) was raised by repeated immunisation of goats with highly purified antigen. Purified IgG was prepared by affinity chromatography. Synthetic peptide LSLKYNNLTKVPRQLPPSLEY-C corresponding to amino acids 204-224 within the N-terminal region of mouse CD289. Ripoll, V.M. et al. (2010) Macrophages from BALB/c and CBA/Ca mice differ in their cellular responses to Streptococcus pneumoniae. J Leukoc Biol. 87: 735-41.